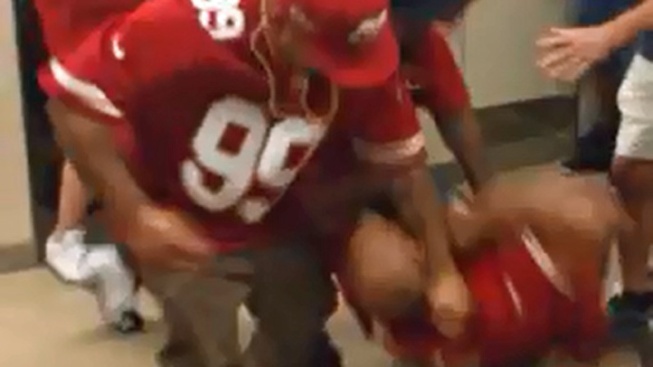 Video of a violent fight in a bathroom at Levi’s Stadium before Sunday afternoon’s kickoff will fuel some of the conversation at a community meeting planned for Tuesday evening. Santa Clara police along with representatives from San Francisco 49ers and Valley Transportation Authority will host the meeting to hear concerns from fans, residents and business owners. Santa Clara Police arrested Dario Rebollero and Amador Rebollero from the King City area on felony assault charges following a violent fight in a bathroom. Video obtained by NBC Bay Area shows the two men punching the victims. In the video, one of the victims falls unconscious to the floor. Those two arrests are not reflected in the Santa Clara police arrest log on Sunday. However, 20 of the 23 arrests that appear on the log happened at the physical address for the stadium in the 4900 block of Marie P. Debartolo Way and at two stadium parking lots. A Stockton man was arrested for battery on a police officer, but the rest were arrested for being drunk. The community meeting is scheduled from 7 p.m. to 8:30 p.m. at Don Callejon School at 4176 Lick Mill Blvd in Santa Clara. The public is invited and no RSVP is necessary.